Here we can let each other know about rules and protocols. Some of these may be something we didn't know about in Supai. (like what time the BC office closes in the village ) or a new standard protocol with in JRI. So Blue Slips are like report cards for guides. When a ranger comes into a commercial guiding camp, they are looking at a few things, I have listed some of those things below. The Blue Slips are not just for bad stuff, if they see something good they will also put it on your blue slip, this is how they know what type of guide you are. But if they see something that isn't within guidelines, they will most likely write it down and that goes into your file and can reflect on JRI. Hey Sabrina, I was curious if there was any way for guides to check (ideally online) how many blue slips we have with the park? Michael, that is a great questions, I am currently working on getting you that answer! InReach: TURN IT ON and START TRACKING!!! Examples: Car accident/pile up/death, road closures, detours, construction, power lines being installed, president visiting the National Park, landslides, forest fires, controlled burns, message on the freeway signs, etc. Email the office: If you see a sign saying X road will be closed due to something on these dates. Just send a quick email to bunnilope@justroughinit.com so that we can plan ahead for the delays and/or detour. NO OVERNIGHT PARKING at the visitors center. HERMIT: park at the trail head at Hermit Rests, at the end of the trip the guest should be dropped off at a venue (I always do Maswik due to the variety of food, gift shop, plenty of nearby parking at the BIC.) while they are eating and gift shopping. You the guide, will be taking a shuttle to Hermit's Rest to pick up the company vehicle. Just note that during the very busy season,I have heard of a guide having to wait for 3 busses to get a ride since there were so many people in line!!! SOUTH KAIBAB: (just my opinion) When I do a South Kaibab to Bright Angel trip I park at the BIC and take a shuttle to the SK Trail head. When we are done with our trip the vehicle is nearby so we can quickly do gear inventory, change (if we have some clean clothes), eat at maswik, and gift shop. DIRECTIONS: If you use the air compressor. You must read the directions even if you have one at home, used one in the past... Read over the instructions!!! So on the forum after I posted about the blue cards, Michael asked if he was able to look them up... since they are a sort of report card. 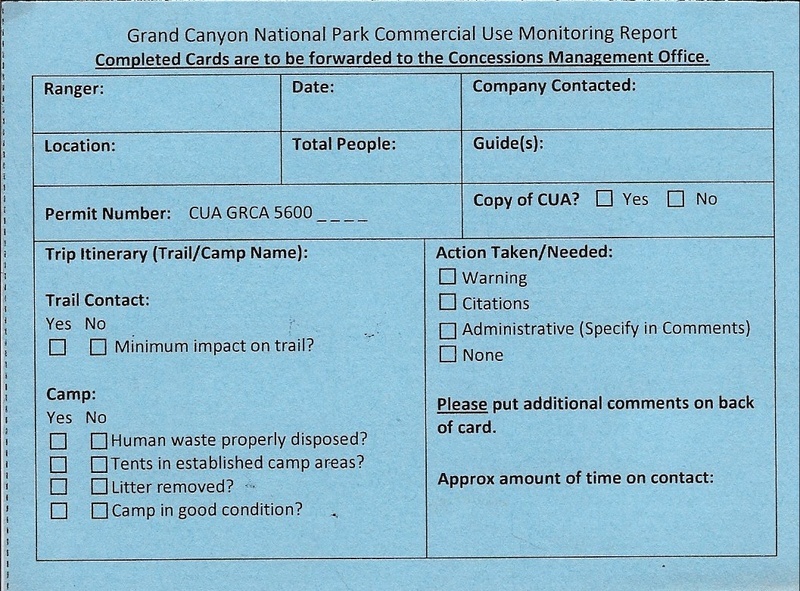 Therefore the next time I was in the canyon, I had a in depth conversation with a ranger about the blue cards. The ranger was happy that we wanted to know more, was willing to share a lot of information, AND he gave me a blank blue card!!! I also asked the ranger about getting a BAD blue card... He said you will know, because you would have received a nice citation or warning. You will know!!! Please see the "Action Taken/Needed" section of the blue card. Attached is a copy of a blue card. Please look it over so that you know exactly what the rangers and the park are looking for. And do it for me it was a lot of weight to carry out, so please make it worth it.